Hey buddee, can you go over what more NVRAM space would mean...better performance? Bigger Builds available? NVRAM is a portion of the flash where all the settings are stored. On most models NVRAM is 32KB and it can fill up fast, especially on dual radio devices that have to store all those extra settings for the 2nd radio. With the E2000 CFE there's 60KB of NVRAM space. If you fill up NVRAM then you can have partial setting loss which can cause erratic behavior or even a complete settings loss. You can check how much NVRAM space you have left by running this command and you'll want to keep a few thousand free if you have ttraff enabled for WAN bandwidth logging. Have just completed this mod and there's definitely some speed improvements on the download stream - so thanks! Excellent, i am guessing you are in EU? If so, are all the channels available for you still? Also... This build fixes any led light issues people may be having with their E2000. Thanks for the nice explanation and tip phuzi0n! just converted my EU wrt320n with the cfe in this thread. so far so good. Good stuff, i have already had 3 other EU users use this same process, seems to work well. All of their channels are in place in the 2.4Ghz spectrum (1-13) which is mainly what i was concerned with. I just followed this procedure and upgraded my WRT320N. + My WRT320N arrived as a "Dead" router- some tool had flashed a WRT160N firmware on it and the switch ports didn't appear to work. I was able to flash a standard WRT320N firmware to it and then follow the procedure that buddee provided. + On at least my WRT320N, I couldn't get the firmware upgrade to take, I kept getting upgrade failed from the web GUI. Turns out that I had to telnet back in and delete the CFE.BIN from the /tmp directory, then the upgrade worked for me on th next try. + To reinforce what buddee notes, BE PATIENT. 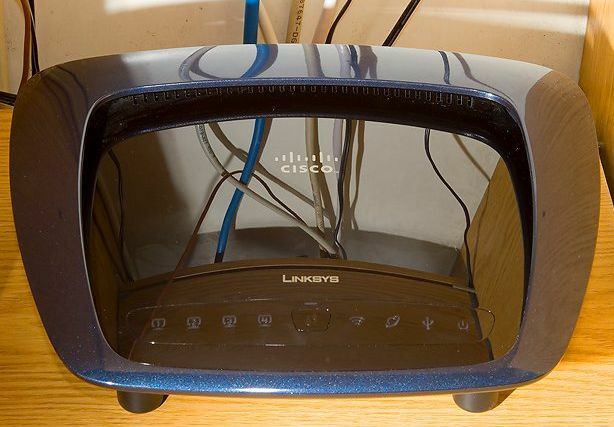 The router will reboot three times, and it takes a while before you get back online. In my case, something greater than 8 minutes from the firmware upload until having a GUI again. Also with this unit, for cooling i was using a piece of wood to hold up the backside of the router for air flow, i am now tried this with putting raised rubber footing on the bottom (pic shown is of my friends WRT610N after adding the bottom feet). Seems to work quite well for these style units. Thanks for the extra info jvwrt! Very cool simple Mod buddee! That's what I am here for.. Nobody listens to me anyway. I always just used windex and a soft washcloth, but the wax would make a much better hold and just looks like it would be cool.